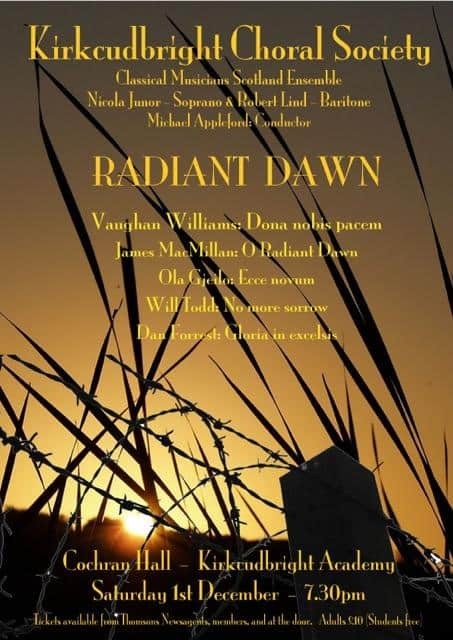 The Cochran Hall at Kirkcudbright Academy provides the venue on 1st December for Kirkcudbright Choral Society’s winter concert, ‘Radiant Dawn’. Ralph Vaughan Williams’ ‘Dona Nobis Pacem’ is a particularly compelling and evocative piece as our Country commemorates the hundredth anniversary of the end of the Great War. Written in 1936, this striking work is a plea for peace, referring to past wars in an era that saw growing fears of a new one. The composition combines the thought-provoking poetry of 19th century American poet, Walt Whitman, (who personally experienced the horrors of the American Civil War) with texts from the Old and New Testaments, the Mass and a political speech made at the time of the Crimean War. The choir will be joined by Soprano soloist, Nicola Junor and Baritone, Robert Lind. Both vocalists are well-known to local audiences and have performed so beautifully on many occasions with the Society. The performance will again be accompanied by the Classical Musicians Scotland Ensemble, a group of professional musicians based in Glasgow, and conducted by the Society’s Musical Director, Michael Appleford. The choir will also perform seasonal music including short works by contemporary composers James MacMillan, Will Todd, Ola Gjeilo and Dan Forrest, whose exciting work, ‘Jubilate’ was so enjoyed at this year’s Spring Concert. The concert starts at 7.30 pm and tickets costing £10 (free for those in full time education) are available from Thomson’s Newsagents, Kirkcudbright, from Choir members and at the door.